Bunk Beds Bunker has a huge selection of bunk and loft beds, bedding, and bedroom accessories in an impressive assortment of sizes, materials and finishes to complement the personal style of each member of your household. BOILING SPRINGS, Pa. - May 6, 2014 - PRLog -- Imagine that little Cindy wants a bedroom designed for a princess; Tommy wants to feel like he’s waking up at Hogwarts each morning; Jack wants a loft bed with storage underneath for his dorm room; and mom and dad want to turn Jack’s old room into a spare room that can accommodate multiple guests. At Bunkbedsbunker.com you can find just the right bed for every member of the family, no matter how varied their tastes may be. The Dollhouse Loft bed with stairs is perfect for a girly-girl like Cindy. Tommy will go nuts for the WOW 22, a low loft bed with a slide, tent top, castle tower and enclosed playroom underneath. Bunk beds aren’t just for kids, though, adults will appreciate the additional sleeping space provided with a full on full bunk set in the guest room. Beds aren’t all you’ll find at Bunkbedsbunker.com. You can have custom bedding made using their Fabric Studio or buy rugs and accessories to match your décor. There are decorating tips and checklists to guide you along the path to designing the perfect bedroom. The on-site blog offers practical information like an illustrated guide to using inseparable sheets on “hard to make” beds. Bunk Beds Bunker offers an extensive selection of high-quality, reasonably priced furniture and accessories for every taste and budget. 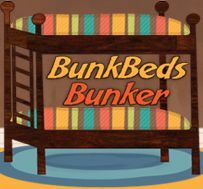 Visit Bunkbedsbunker.com before beginning your next bedroom remodel. You’ll be glad you did!